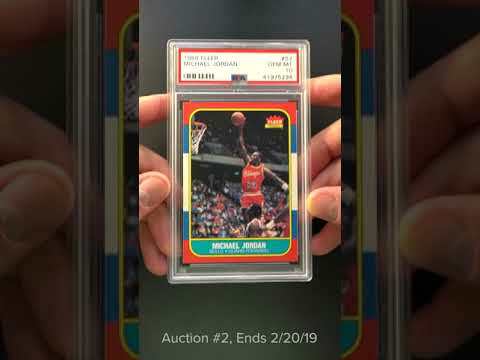 Widely considered the holy grail of Michael Jordan rookie cards and incredibly popular within a perfect PSA 10 holder. The '86 Fleer MJ production is an iconic rookie card and perhaps the most recognized modern card in existence. This card in PSA 10 will always have an extreme demand and represents one of the best investment opportunities in the hobby. We feel that this card is still very much under valued and could soar in price as world wide investors continue to target this elite offering aggressively. This freshly graded example easily ranks among the best 10s we've brokered with its undeniable GEM MINT qualities. Perfectly centered with untouched corners and blemish free edges. The surfaces are sensational with glowing color, perfect print and flawless clarity. They simply don't get any better than this. A blue-chip commodity which comes highly recommended by PWCC. One of over 15,000 cards, lots, and sets up for bid in our 2nd Auction of 2019. Click on the link above to view the other PWCC auction lots. The PWCC Vault is now live! Open a PWCC Vault account and receive a custom Vault shipping address. Purchases shipped to the Vault receive free shipping and reflect Oregon's 0% sales tax rate.